Each $22 box contains 4 packs. Each pack contains 10 cards. Behold the Awesome Teeth of Tyrantrum-EX! The Pokemon Tyrantrum-EX box includes a never-before-seen promo card featuring this extra-chompy Pokemon, plus a stunning oversize card. 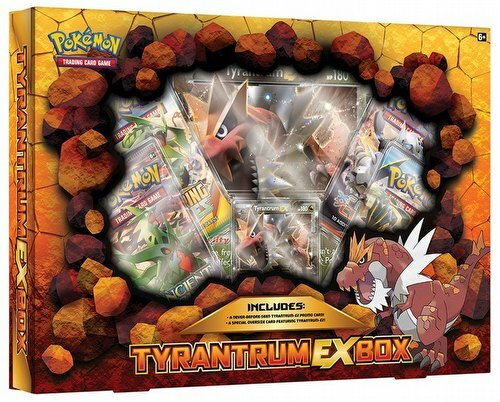 This fearsome Pokemon definitely raises the danger level of your collection, so grab this ferocious Tyrantrum-EX box before it grabs you! Each box also includes 4 booster packs and a code card the Pokemon Trading Card Game Online.